Mellor Prehistoric site is situated on a hill in the village of Mellor, Greater Manchester, six miles south east of the centre of Stockport and a few miles from the border with Cheshire. Located on the western edge of the Peak District National Park, the hill fort overlooks the Cheshire Plain. 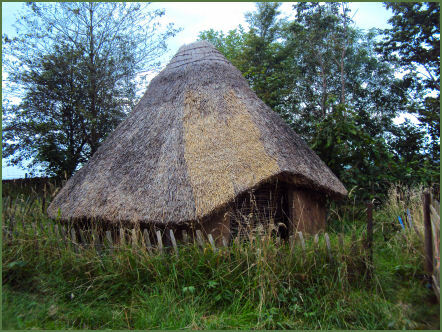 The fort was founded in the Iron Age by members of the Celtic Brigantes tribe, but archaeological evidence reveals that the site was occupied as far back as the Bronze Age (8,000 BC), when it is thought it may have been a seasonal camp or a knap site for the production of flint tools, it remained occupied up to the Romano-British period. The settlement at Mellor was discovered in the 1990's when local historians John and Ann Hearle, of the Old Vicarage in Mellor, spotted cropmarks on the lawn and gardens and fields surrounding their home during a drought. 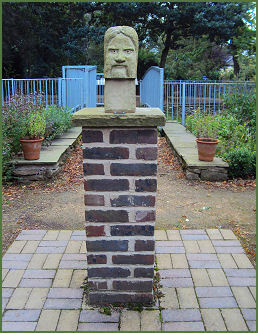 Excavations of the site by Manchester University Archaeological Unit commenced in 1998 when the ditch of a large Iron Age hill fort was revealed at the West end of the Old Vicvarage garden, the ditch contained Roman and Iron Age pottery. The drainage gulley of an Iron Age roundhouse, 13 measuring metres across, was also discovered in the middle of the Old Vicarage garden. 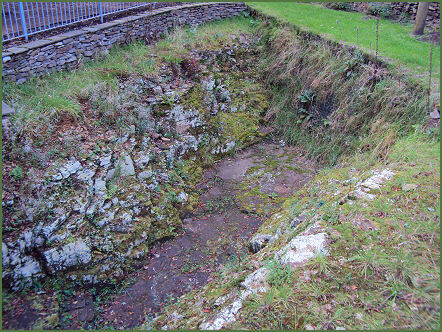 Alongside it there was an area of gullies and post-holes. 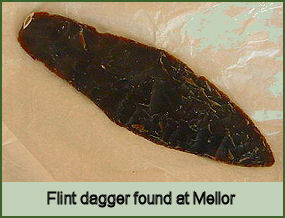 A flint dagger was found on the site which has led to the interpretation that during the Bronze Age the site was used for funerary practices. Many of the hills near Mellor are surmounted by Bronze Age funerary monuments such as Brown Low, Shaw Cairn, and Werneth Low. A Bronze Age rare high-status amber necklace was also unearthed at the site, which formed part of a 4,000 year old burial. The Iron age occupants of the fort dwelled in roundhouses, the site was probably divided into separate areas for habitation, industry, and agricultural activities. Excavations revealed that the area enclosed by the inner ditch mainly served as a habitation area, while the area between the inner and outer ditches was used for agricultural purposes. An Iron Age roundhouse has been reconstructed at Mellor by students of archaeology from Ridge Danyers Sixth form College in nearby Marple through a European Community Culture Programme, the roundhouse is now one of the highlights of the site. There have also been finds of medieval pottery and arrowheads, radio-carbon dating revealed there was a structure dating from around the fourteenth-fifteenth centuries. It t was most probably the original Mellor Hall, the home of Roger de Melleur, the King’s Forester of the Peak. St. Thomas's Church, adjacent to the site, contains an interesting Saxon carved stone font, probably dating from the eleventh century.